Roughly 97% of website visitors are in research mode, so your nonprofit's website not only has to cater to those looking to make a donation or volunteer, but you must educate the majority of visitors about your organization and its cause. Your website is the destination for your current and potential supporters to find all the information they need to know about you. It needs to be as user-friendly and informative as possible, to keep these individuals engaged, sharing information about you on social media, and coming back to support your organization in the future. 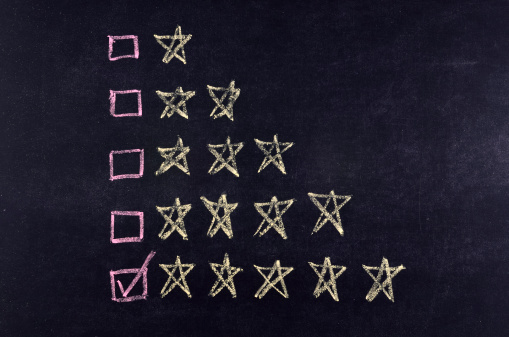 Charity Navigator rates nonprofits in the U.S. based on their financial standing, accountability, and, with its new 3.0 rating system, an evaluation as to how they measure and report results of their work to the public. What better way to share your results than through your online channels -- specifically, your group’s website? Here are nine nonprofit sites that are highly ranked by Charity Navigator, aesthetically appealing, clear and concise in their communications, and engaging with prospective and current donors and volunteers. Ranked number four on the 10 Top-Notch Charities list, Project C.U.R.E is the "largest provider of donated medical supplies and equipment to developing countries around the world." Its website has clear calls-to-action right under its mission statement. You know exactly what the nonprofit does and how you can support it as soon as you land on its homepage. 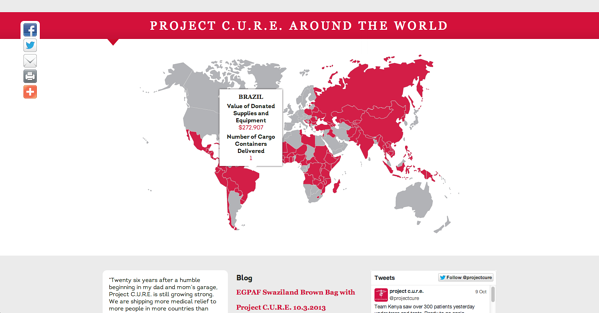 The group also has a map of the world, highlighting the countries it currently has projects in, which you can hover over and see the value of donated supplies and equipment. This is an excellent way of showing the impact and scale of the organization’s efforts. 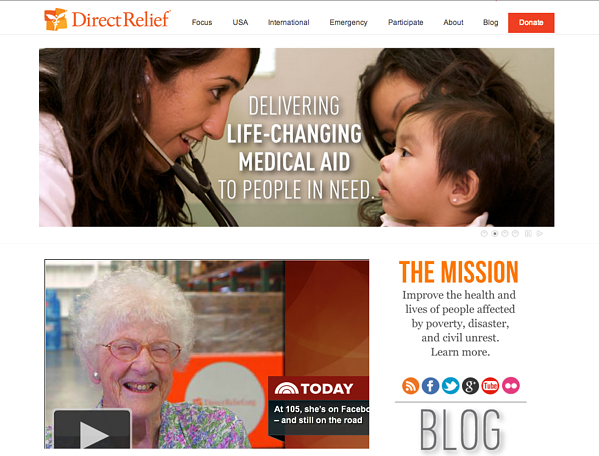 At number five on the Top-Notch Charities list, Direct Relief is an organization with the mission to “improve the health and lives of people affected by poverty, disaster, and civil unrest.” The nonprofit's website clearly states its mission and ways to donate and volunteer above the fold and also shows a feed of current news about the organization. Listed at the eighth-best spot on the 10 Top-Notch Charities list, CAF America identifies itself as "a global grantmaking organization assisting corporations, foundations and individuals" that "streamlines the grantmaking process to eliminate risk and administrative burden." The group's site not only features beautiful images, but it also offers individuals a chance to subscribe to an email list that shares important updates and stories about the "global philanthropic landscape" and how it's changing. Ranked third on the 10 Charities Worth Watching list, Child Aid assists kids in Central America through various educational initiatives. The organization uses gorgeous images from the field on its homepage and includes some great, concise text to highlight the impact of its work and its supporters' contributions. 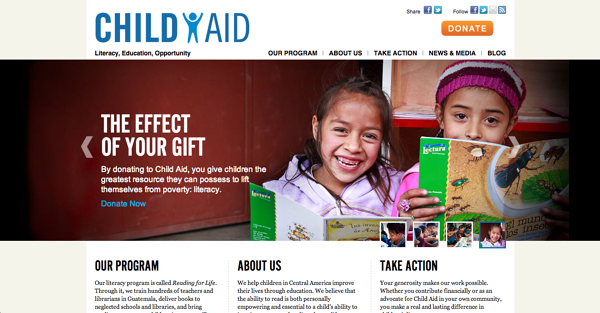 Child Aid also features stories from its very active blog on the homepage, which helps draw in visitors to learn more about the organization’s impact before they decide to give or volunteer. 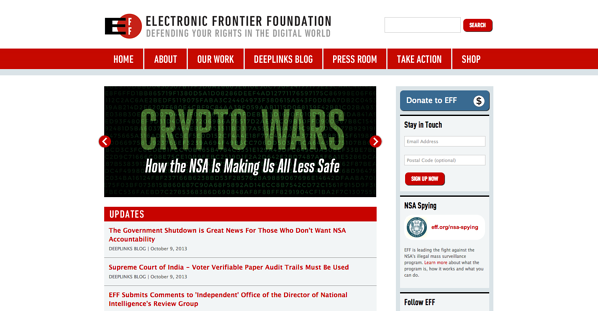 EFF, which uses its website to share news related to its cause, notched a spot at number five on the 10 Most Frequently Viewed Charities list. Specifically, the group educates the public on the NSA’s illegal mass surveillance program through its blog, in-person events, and whitepapers. The organization uses content to educate its audience and drive engagement and support in a variety of different ways. Ranked number six on the Most Frequently Viewed Charities list, Feeding America’s mission is to "feed America’s hungry through a nationwide network of member food banks and engage our country in the fight to end hunger." 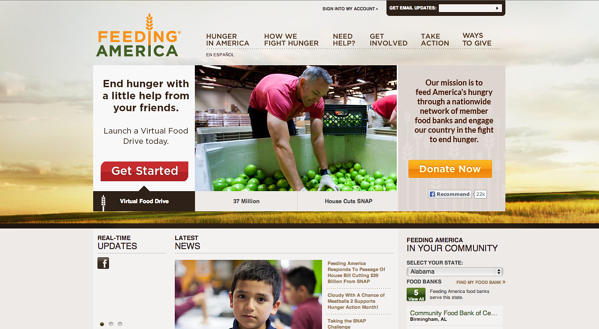 The group's website has a large amount of information about hunger in America, showing that the organization is a thought leader on the issue. It also provides an array of info and resources for families in need of food assistance on its site. At the fourth spot on Charity Navigator's 10 Most Followed Charities list is the WWF -- a wildlife organization that's been around for five-plus decades. The nonprofit's website is not just a place to make a donation, but also one to learn about different species, locations, and threats to wildlife around the world. The awe-inspiring imagery the WWF displays on its site helps it draw visitors in to learn more and educate them on how the organization helps to "conserve the world’s most important natural places and significantly change global forces to protect the future of nature." This image of a gorilla leads to an article about seven important facts you should know about the species -- just one prime example of the extensive educational content on its site. Ranked number six on the Most Followed Charities list, World Vision works in several dozen countries in efforts to develop solutions to end economic-related issues, including poverty. Its website shows the clear progress it has made with an in-depth overview of how many people, communities, and disaster-relief and emergency responses it's supported since 1990. 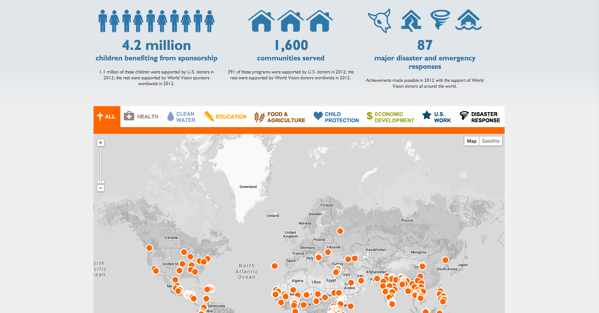 Similar to Project C.U.R.E., World Vision has a map (shown below) that tracks each of the issues it's impacted across the world, including health, clean water, education, child protection, and economic development. Making the 10 Most Followed Charities list, the NRDC is a grassroots group aiming to fix and raise awareness of environmental issues. 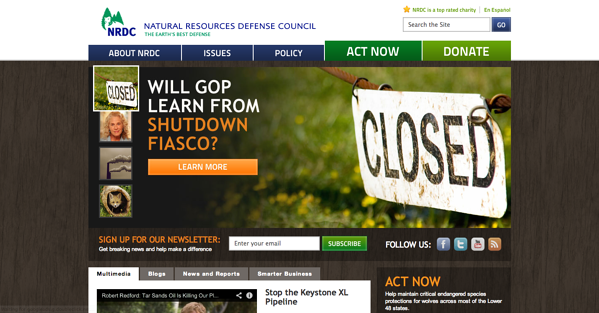 Including information on how to support the organization, the NRDC highlights the major issues and policies impacting the environmental movement on it site. 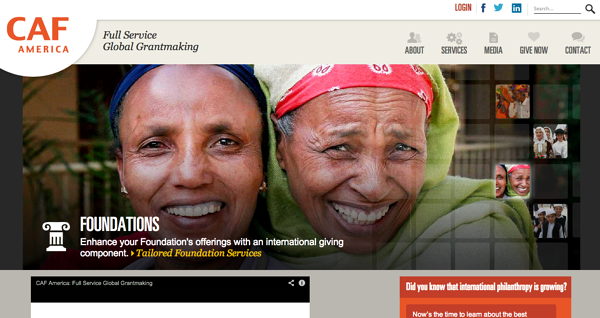 What other nonprofit websites not listed here do you think are setup well? How does your own nonprofit's site look? Give us your thoughts below!